Square Pharmaceuticals Ltd. was incorporated on 1964 as a Pharmaceuticals company. In present Square Pharmaceuticals Ltd. (SPL) is one of the most successful Pharmaceuticals companies among all the private Pharmaceuticals Companies in Bangladesh. This report is prepared as a requirement of the internship program focused on specially “Analysis of Financial Soundness” of Square Pharmaceuticals Ltd. (SPL). I have divided this report in six major parts. First part is Introduction, where prologues, Objectives of the study, Research methodology of the study and Limitations of the study have been presented. Second part is Overview of Square Pharmaceuticals Limited consisits of Annual Report 2010 of Square Pharmaceuticals Limited, Corporate History, Vision, Mission, Objectives, Corporate Focus, Management Apparatus, Strive, Ten Principles, Corporate Oprational Results. Third part is Financial Soundness Analysis, where Definition of Financial Soundness Analysis, Definition of Ratio Analysis, Time-Series Techniques, Cross Sectional Techniques, Liquidity Ratio, Activity Ratio, and Debt Management Ratio & Profitability Ratio have been discussed. Fourth part is Results of Financial Ratios of SPL & their Interpretation, where Financial Soundness of SPL has been discussed with the help of ratio analysis and graph. Fifth part is Findings, where Short Term Financial Strength, Long Term Financial Strength & Efficiency of Profitability have been presented. And the last and Sixth part consists of Recommendation, Conclusion and References. Financial soundness measure is an effective used tool in measuring a company’s strength and weakness. Various types of tools are generally used in this regards. This study has taken an effort in order to assess the financial soundness of Square Pharmaceuticals Ltd. to pinpoint its probable strength and weakness. The main purpose of this report is to analysis the financial position of the Square Pharmaceuticals Ltd.
To identify the financial soundness of the Square Pharmaceuticals Ltd.
To focus the financial strengths and weaknesses of the Square Pharmaceuticals Ltd.
To identify the net sales Square Pharmaceuticals Ltd.
To know the total debt of the Square Pharmaceuticals Ltd.
To know the liquidity of the Square Pharmaceuticals Ltd. The study was designed from descriptive point of view. The report is prepared by using secondary data. Different books, articles, annual reports and websites were used as sources for secondary data collection. Time insufficient to know all activities about the Square Pharmaceuticals Ltd.
Scarcity of information about the Square Pharmaceuticals Ltd.
Inexpertness to write a report. I have tried my level best to make this report a true, bias-free and informative one. I hope that it will provide an original picture of Square Pharmaceuticals Ltd. Annual Report of Square Pharmaceuticals Limited is a very useful report for analysis of its financial performance. This report explained about financial strength. Customer service, risk management, corporate social responsibility, and good governance. Director’s Report section explained the global economy and Bangladesh economy. This report tried to accumulate all the relevant data and topics regarding financial performance. This report would be very helpful and handy for potential investors and policy makers. This report also explained different accounting policies and depth analysis of financial position. In addition to that, it discuss about the industry performance. It also tells us about the trend of financial performance. In addition to that, emphasis is given on that information that creates positive impression about the company and the information in their own way. We view business as a means to the material and social wellbeing of the investors, employees and the society at large, leading to accretion of wealth through financial and moral gains as apart of the process of the human civilization. Our objectives are to conduct transparent business operation based on market mechanism within the legal & social frame work with aims to attain the mission reflected by our vision. We in SQUARE, strive, above all, for top quality health care products at the least cost reaching the lowest rungs of the economic class of people in the country. We value our social obligations. We owe our shareholders and strive for protection of their capital as well as ensure highest return and growth of their assets. We strive for best compensation to all the employees who constitute the back-bone of the management and operational strength of the company through a pay-package composing salary/wages, allowances, bonuses, profit participation, leave salary and superannuation & retirement benefits. We strive for the best co-operation of the creditors & debtors the banks & financial Institutions who provide financial support when we need them, the suppliers of raw materials & suppliers who offer them at the best prices at the opportune moments, the providers of utilities-power, gas & water etc. and the customers who buy our products & services by redeeming their claim in time by making prompt payment and by distributing proper product on due dates to our customers. We strive for fulfillment of our responsibility to the government through payment of entire range of due taxes, duties and claims by various public agencies like municipalities etc. We strive, as responsible citizen, for a social order devoid of malpractices, anti-environmental behaviours, unethical and immoral activities and corruptive dealings. AGM in time, distribution of dividends and other benefits to shareholders, reporting/dissemination of price sensitive information, acquisition of shares by insiders, recruitment & promotion of staff, procurement & supplies, sale of assets etc. all that directly and indirectly affect the interest of concerned groups – the shareholders, the creditors, suppliers, employees, government and the public in general. We strive for equality between sexs, races, religions and regions in all spheres of our operation without any discriminatory treatment. Financial Soundness Analysis includes the study of relationships within a set of financial statement at a point in time and with trends in these relationships over time. Ratio analysis expresses the relationship among selected items of financial statement data. A ratio expresses the mathematical relationship between one quantity and another. Constructing trend statements involves choosing one year as a base & then expressing the statement items of subsequent years relative to the value in the base year. One impetus to the development of the common-size statement came from the problems in comparing the financial statements of firms that differ in size. The most widely discussed the financial technique is a comparison of ratio across firms. Numerous individual ratios have been proposed in the literature. The ratios that show the relationship of the firm’s current assets to its current liabilities are known as liquidity ratios. It measures the firm’s ability to satisfy its short term obligation as they come due. The ratios that measure how effectively a firm is managing its assets are called activity ratios. The ratios that measure the ability of the firm’s long term financial solvency are called debt management ratios. Long term creditors and stockholders are particularly interested in a company’s ability to pay interest as it comes due and to repay the face value of debt at maturity. 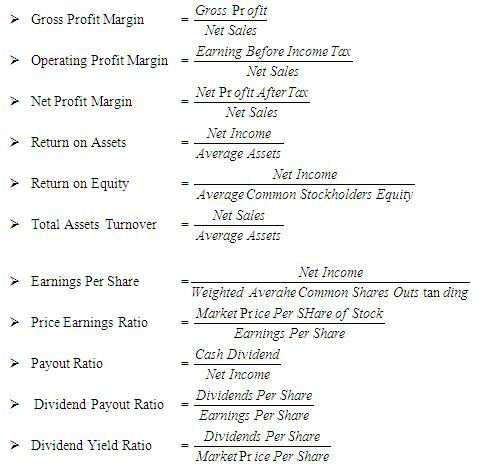 A group of ratios showing the effect of liquidity, assets, management and debt management on firm’s operation are called profitability ratios. The current ratio is widely used measure for evaluating a company’s liquidity and short term debt paying ability. Current Ratio indicates the extent to which current liabilities are converted by current assets. The ratio is computed by dividing current assets by current liabilities. Quick ratio or Acid test measures the company’s immediate short term liquidity. The acid test is designed to measure how well a company can meet its obligation without having to liquidate or depend too heavily on its inventory. It is computed by dividing the sum of cash, short term investment and net receivables by current liabilities. The Receivables Turnover is a rough measure of how many times a company’s accounts receivable have been turned into cash during the year. The ratio is used to assess the liquidity of the receivables. It is computed by dividing net credit sales by average net receivables. Inventory Turnover ratio measures how many times a company’s inventory has been sold and replaced during the year. Its purpose is to measure the liquidity of the inventory. It is computed by dividing cost of goods sold by the average inventory. Average Collection Period measures average amount of time needed to collect accounts receivable. Average Payment Period measures the average amount of time needed to pay accounts payable. Debt ratio measures the proportion of total assets financed by firm’s creditors. This ratio indicates the company’s degree of leverage. It also provides some indication of the company’s ability to withstand losses without impairing the interest of creditors. It is computed by dividing total debts by total assets. Gross Profit Margin measures gross income per TK. of sales. It is computed by dividing gross profit by net sales. Operating Profit Margin measures operating income per TK. of sales. It is computed by dividing earning before income tax by net sales. Net Profit Margin measures the net income per TK. of sales. It is computed by dividing net profit after tax by net sales. Return on Assets (ROA) provides as idea of the overall return on investment earned by the firm. This ratio is computed by dividing net income by average assets. Return on Equity (ROE) measures the rate of return on common stockholders investment. It measures profitability from the common stockholders viewpoint. This ratio shows how many tk. of net income were earned for each tk. invested by the owner. It is computed by dividing net income by average common stockholders equity. Total Assets Turnover indicates the efficiency with which the firm uses its assets to generate sales. It is determined by dividing net sales by average assets. An Earnings per Share (EPS) is a measure of net income earned on each share of common stock. It is computed by dividing net income by the number of weighted average common shares outstanding. Company’s liquidity position has been increased in 2010 than previous two years. Current Ratio & Quick Ratio have been increased. Inventory Turnover has been increased in 2010 than previous two years. Average Collection Period has been decreased than previous years. But Receivables Turnover has been decreased than previous two years. It means the Receivables Turnover is not good but current capital management has been developed. So the company should give more emphasize to improve the receivables turnover. The financial performance of Square Pharmaceuticals Ltd. is good in 2010 than previous two years. The Debt Ratio of SPL has been declined in 2010 than previous years. So the company’s long term debt payment power has been increased. The Profitability Ratio of Square Pharmaceuticals Ltd. is in a stable position. Although some of them has been decreased. Gross Profit Margin, Return on Assets, Asset Turnover & Payout Ratio have been increased in 2010. On the other hand, Operating Profit Margin, Net Profit Margin, Return on Equity, Earnings per Share, Dividend Yield Ratio and Dividend Payout Ratio have been reduced in 2010. It means the company is not utilizing its assets in a proper way. So the company should give more attention to increase their profit for the next year. The company should give more attention to improve efficiency in utilizing the capital. The company should give more attention on how to effectively manage its cost and revenue mixes. The company should give more emphasizes in making the investment decision in a much better way. The financial soundness picture of Square Pharmaceuticals Ltd. shows that it has performed better in different specific aspects like short term and long term debt payment. However it has yet some financial and operating areas like profitability where those need much attention to be given. It can consider same actions recommended to improve its financial performance in the years to come.